Check out the GTX 1050 and GTX 1050 Ti’s full specs below. The $110 MSI GTX 1050 OC with 2GB of RAM adds a roughly 50MHz overclock (to 1,404MHz base/1,518MHz boost) without any extra cost. 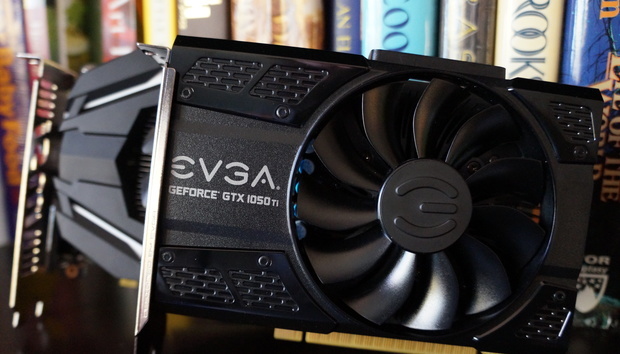 The $140 EVGA GTX 1050 Ti SC Gaming with 4GB of memory ups things a bit further over the stock GTX 1050 Ti, to 1,354MHz base/1,468MHz boost, with the help of EVGA’s ACX 2.0 cooling technology. Intel’s Core i7-5960X ($1,000 on Amazon) with a Corsair Hydro Series H100i closed-loop water cooler ($104.20 on Amazon). An Asus X99 Deluxe motherboard ($280 on Amazon). Corsair’s Vengeance LPX DDR4 memory ($94 on Amazon), Obsidian 750D full-tower case ($145 on Amazon), and 1,200-watt AX1200i power supply ($310 on Amazon). A 480GB Intel 730 series SSD ($245 on Amazon). We’re comparing the $110 MSI GTX 1050 OC and $140 EVGA GTX 1050 Ti against Sapphire’s $140 4GB Radeon RX 460, XFX’s $220 Radeon RX 470 Black Edition, and the GTX 1050’s predecessors, the EVGA GTX 750 Ti and EVGA GTX 950 SSC. (Remember, however, that the GTX 950 wasn’t considered a direct GTX 750 successor like the GTX 1050 is, and demands a six-pin power connector—as does the 4GB RX 460). All of these cards are custom-cooled, overclocked models. We benchmark every game using the default graphics settings unless otherwise noted, with all vendor-specific special features—such as Nvidia’s GameWorks effects, AMD’s TressFX, and FreeSync/G-Sync—as well as VSync and frame rate caps disabled. Based on the target performance of the GTX 1050 and GTX 1050 Ti, we’re looking at 1080p results alone today, including Medium fidelity. The Division, a gorgeous third-person shooter/RPG that mixes elements of Destiny and Gears of War, kicks things off with Ubisoft’s new Snowdrop engine. The GTX 1050 comes out slightly ahead of the RX 460 here, while the extra horsepower inside the GTX 1050 Ti widens the gulf. Both of Nvidia’s new cards clear a console-matching 30 frames per second at Ultra graphics settings, while the GTX 1050 Ti indeed flirts with 60 fps if you drop the eye candy down to Medium. The $110 GTX 1050 also essentially ties the older GTX 950 in the closest matchup between the two very evenly matched cards. Also note how much of a whupping the GTX 1050 family puts on the older GTX 750 Ti, and how much of a leap in performance stepping up to a $180 to $200 Radeon RX 470 offers. You’ll see similar results in every game tested. Important note: Hitman automatically caps the game’s Shadow Maps and Shadow Resolution to medium, and Texture Quality to low, on cards with less than 4GB of onboard memory. Because our sampling represents a mix of 2GB and 4GB cards, we tested at Medium settings with Texture Quality set to low in both DX11 and DX12. The 4GB cards tested here could boost image quality across the board in this game. The 2GB GTX 1050 sees performance dip in DirectX 12, but that’s common in 2GB cards. Comparing the Radeon RX 460 and GTX 1050’s best results (DX12 and DX11, respectively) shows Nvidia’s card holding a slight performance advantage. Once again, Nvidia’s new budget card barely beats out the last-gen GTX 950. The $140 EVGA GTX 1050 Ti holds a commanding lead over the 4GB Sapphire Nitro RX 460 OC, even though it costs the same and Hitman is an AMD Gaming Evolved title. This isn’t shaping up well for the 4GB Radeon RX 460 at all. Whereas Hitman adores Radeon GPUs, Rise of the Tomb Raider performs much better on GeForce cards. It’s also the single most drop-dead gorgeous PC game I’ve ever laid my eyes on. We only test the game’s DirectX 11 mode. While the GTX 1050 cards were able to overcome Hitman’s Radeon focus to deliver a win over the RX 460, Team Red failed to pull off a similar upset in this GeForce-centric game. The GTX 1050 pummels the 4GB RX 460, and the GTX 1050 Ti outright embarrasses it by about 20 frames per second, even though the Sapphire card packed an extra six-pin power connection. Nvidia’s new cards also thoroughly outpace the older GTX 750 Ti. As the newest entry to our testing suite, the DirectX 12-exclusive Gears of War 4 scales superbly across all types of hardware. Its DX12 implementation is more vendor-agnostic than Hitman and Ashes of the Singularity’s, both of which heavily favor AMD. The GeForce GTX 1050 family wipes the floor with AMD’s entry-level card in every traditional gaming metric, but AMD’s cards still hold a major advantage when it comes to budget gaming: FreeSync monitors. FreeSync monitor are significantly cheaper than G-Sync monitors,starting at around $130 on Amazon for a basic 1080p display, and the gameplay-smoothing, tear- and stutter-killing joy of a variable refresh rate monitor can’t be overstated. If you plan on buying a variable refresh rate monitor to pair with your new graphics card, a Radeon RX 460 and FreeSync display combination could be enticing, especially if you plan to stick with Radeon cards for the long haul. But I’d rather buy a GTX 1050 Ti and rely on its nearly 30 percent average performance advantage over the RX 460 in the vast majority of circumstances.